This past weekend was one of those rejuvenating, good for the soul kind of weekends. Three days with my family, filled with skiing, good wine, tasty homemade meals, a slushy stroll to the local maple man, a concert and a decadent meal out. In anticipation of spending Saturday at the hill, I decided to make some lunch time snacks. Knowing my family would pack veggies and hummus, I opted for a hummus alternative and some crispy gluten & cinnamon free (catering to my sister's dietary restrictions) crackers. I had brought the snacks on the train with us and was slightly worried that they would never make it to the ski hill. Self control when something tastes this good is not my forté. 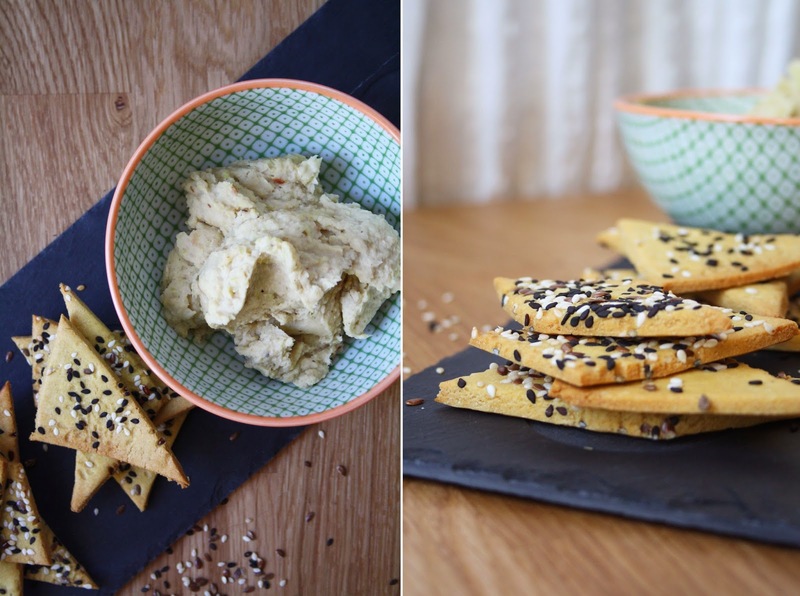 The crackers stayed crunchy and are packed with a unique, unexpected chickpea flavour; and the dip - I can't even describe how tasty it was, perfect alternative to hummus if you ask me. In a medium size bowl, combine the chopped leeks, garlic cloves, oil, salt and pepper. Mix to combine. Spread onto a parchment lined baking sheet and roast for 15 minutes. Heat the beans in the microwave for 1 minute; warmer beans = creamier dip! While the leeks are roasting, combine the other ingredients in a food processor. When the leeks are ready, add them to the bean mixture. Slide the garlic out of their skins and add them to the mix as well. Pulse for a few minutes until you achieve a lumpy, yet smooth consistency. Taste and adjust seasoning. Delicious served warm, or cold. In a large bowl, combine the flour, salt and baking powder. Using your hands, work the olive oil into flour for about 2 minutes - eliminating any large lumps and distributing the oil evenly. Gradually drizzle the warm water over the dough and use your hands to slowly work it through. The dough should start to come together into a ball - if its too dry, add more water in 1/2 T increments. Continue to knead the dough for 5 minutes. Divide it into 2 pieces, wrap each in plastic wrap and let rest for 10 minutes. Prepare a flat, clean, work surface with 2 pieces of parchment (roughly baking sheet size). Set one sheet aside. Place a dough ball on the lower piece of parchment, flatten slightly with your palm. Place the second sheet on top, and using a rolling pin, roll the dough out to an 1/8" thickness. Trim the edges, sprinkle with seeds, cover with parchment and roll briefly again (this ensures the seeds will stick). Cut the dough into rectangles, squares or triangles (I went a little wild on mine and tried out ALL the shapes). Transfer to your baking sheet. Repeat the same process until all the dough has been used up. Once all the crackers are ready for the oven, use a pastry brush (or your finger), to lightly brush the tops with olive oil. Bake for 12-15 minutes, rotating the pan halfway through. (If the crackers are larger then mine, they may take a bit more time).